What's Facebook good for, and what's Twitter good for? I have been intending to write in detail about my twitter usage for a while, with the objective being to get many of my non-twitter-user friends to start using Twitter. Never got around to it, with it always being a low priority. The above interesting conversation on Facebook today triggered this blogpost in which I hope to clarify from my perspective the answer to the question "What's Facebook good for, and what's Twitter good for?" People use Facebook and Twitter to disclose different levels and types of information. On Facebook, the information shared is of a more intimate nature, with people sharing their families' pictures, videos, stories, and other information of personal nature. On twitter, the amount of information shared is limited to words. Yes, people can share pictures and videos on twitter, but that isn't what the site is geared towards, and that is not the general usage. Twitter is pure and simple a communication forum where anyone can listen (or not listen) to anyone else, whether they know the other person or not. There is no restriction on who one can follow (yes, I know there is the concept of private twitter accounts; that to me is an irrelevant feature, and it is too uncommon these days that I come across one). So people can follow the conversations of anyone they find interesting. Facebook has restrictions on who you can communicate with; given the intimate nature of information shared by users there, it has to have that kind of restrictions in place. And it is natural that people respond to friend requests on Facebook only from people they know in real life. Accepting someone as a Facebook friend means a certain level of trust. Following someone on Twitter involves no concept of trust. You find the person interesting; you follow them and listen to their tweets. So in summary, Twitter is the place where I can get to know people who share same interests as me. And Facebook allows me to connect with those people with whom I have had more meaningful interactions. 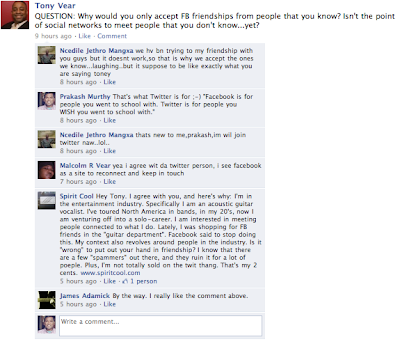 There are quite a few people I got to know through twitter who later on became friends on Facebook. Each tool has its own advantages and disadvantages; gotta make the best of the advantages, and use the right tool for the requirement.